Valve has launched a beta for virtual collectible cards that can be turned into badges or traded for other exciting stuff on Steam. Because Valve's biometric feedback systems revealed that you were going to ask for it, the masterminds behind Steam have rolled out their very own digital trading card sets! Offered for a limited but growing number of games, Steam trading cards can be collected and then turned into unique game badges that can earn "marketable items" like emoticons, profile backgrounds and coupons. And because the badges have experience levels, collecting sets multiple times will level them up and bring you even more items. 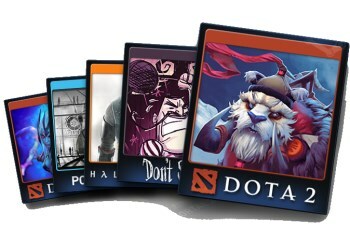 At the moment, Counter-Strike: Global Offensive, Team Fortress 2, Dota 2, Portal 2, Half-Life 2 and Don't Starve are set to drop cards as you play. Up to half the cards in a set will be added to your inventory simply by playing the games, while the rest will have to be collected from other Steam users. Once collected, full sets can be crafted into badges, which bring with them the aforementioned random items as well as 100 experience points toward your Steam level. And what are Steam levels, you ask? Maybe you should check out the Steam Trading Cards FAQ, which explains things like showcases, what you can do if you make a bad trade (hint: nothing), foil trading cards (which aren't actually foil) and all sorts of other interesting stuff. It all seems a little silly to me, but I said the same thing about achievements and look how that turned out. The Steam Trading Card beta is live now; to join, you'll need to opt-in to the beta program in your Steam account and then hook up with the Trading Cards Group group. Invitations will be sent out in the order of members joined - and since at last look there were a little more than 17,000 members, you might want to get a move on.